In 2006, at the request of the City of Cleveland, The Finch Group (“TFG”) team began the development plan for revitalizing the Upper Chester district of the historic Hough neighborhood. That community-based effort culminated in a master plan published on December 10, 2007. On January 21, 2009 the City of Cleveland and TFG entered into a Letter of Understanding for TFG to coordinate the implementation of the 2007 master plan. Because of the worldwide financial crisis, the development was put on hold, but subsequently in November, 2012 legislation was approved permitting the City of Cleveland to enter a development agreement with The Finch Group. TFG had been working with the community, led by former City Councilwoman Fannie Lewis and, for the past five years with City Councilman TJ Dow, since 2007 conceiving a plan that met the economic realities required for a successful development. The final master development plan was fully endorsed by the neighborhood. Innova’s first phase, completed in June, 2015, consists of 177 units of luxury residential apartments, 23,000 square feet of retail space and sufficient on grade parking. The building has 24 hour per day concierge/doorman in a two story over-sized lobby, a full 2,100 square foot fitness center, ultra-high speed WiFi throughout the entire property, a rooftop deck and resident’s rec room. The estimated total development cost, including rent up reserves, is $42M. Innova is uniquely located immediately adjacent to four major “Eds and Meds” institutions; the Main Campus of the Cleveland Clinic, Case Western Reserve University (with its new Medical School campus, built in partnership with the Cleveland Clinic, being constructed directly across the street from Innova); one of the largest VA Hospitals in the United States and University Hospital. These four institutions, which alone employ over 41,000 people, have recently expended over $3B on expanding their physical plants and an additional $3/4 billion of construction currently underway. Included in the new construction is a 374,000 sf Cleveland Clinic Cancer Treatment Center located approximately 300 yards south of Innova and the 450,000 sf Case Western/Cleveland Clinic Health Education Campus. Additionally, Case Western Reserve University has completed the first phase of the rehabilitation of a historically significant synagogue, into its new School of the Performing Arts, immediately east of Innova. As is apparent, the institutions have no capacity to relocate. Other employers in the immediate area, known as Greater University Circle, employ an additional 40,000+ individuals primarily in the medical, education and research fields. All of the above institutions, as well as Cleveland’s Cultural treasures: The Cleveland Museum of Natural History; Cleveland Botanical Garden; The Western Reserve Historical Society; The Cleveland Institute of Music; The Cleveland Museum of Art and Severance Hall, home of the world famous Cleveland Orchestra are located within 0.8 miles of the front door of Innova. Innova, The Finch Group’s development in the Upper Chester Neighborhood of Hough, is the catalyst for the area’s re-invigoration. It is expected to transform this formerly depressed part of Cleveland by anchoring a 24-hour community, one that will bring life to the neighborhood, retail services and approximately 140 full time jobs. 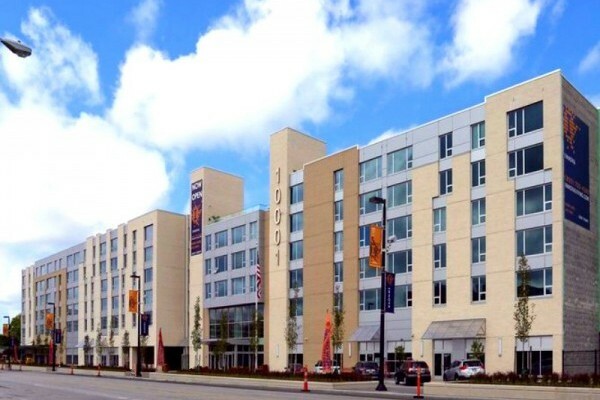 Because of its close proximity to University Circle, Innova connects the Cleveland Clinic’s Main Campus to Cleveland’s Cultural Institutions, the new VA Hospital, Case Western Reserve University and University Hospital. University Circle is one of only two Cleveland neighborhoods experiencing both job and population growth. With the addition of Innova, this culturally rich neighborhood is also experiencing a modern day renaissance.